Simultaneous-monolithically molded body with inserted metal core has high stiffness, preventing external leakage and seat leakage even against a strong external force. 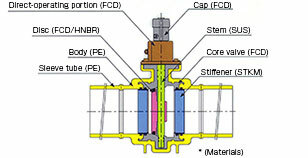 The boundary between PE and metal is firmly sealed with an O-ring and stiffener. 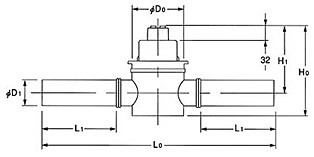 Adoption of butterfly valve as the core valve reduced face-to-face dimensions and outer diameter comparable with EF joints, eliminating interference with other buried products during installation and maintaining almost equivalent weight to fully PE products. Adopting highly dust-resistant special rubber as the disc seal in the dual eccentric structure (butterfly valve) provides excellent sealing performance. 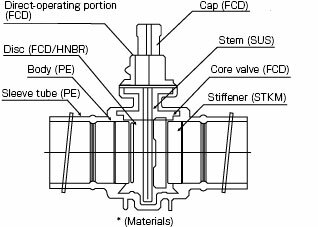 Sealing by metallic core valve inserted to the body reduces fluctuation of torque regardless of external force or temperature change, providing stable opening/closing operation. 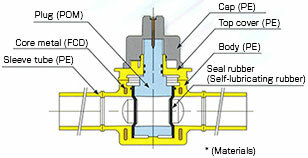 A newly developed operating portion has direct-acting (90°C opening/closing) self-lock mechanism, eliminating a release-lock action during operation and enabling quick valve operation in case of emergency. 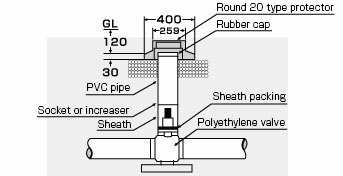 Adoption of self-lubricating disc seal rubber eliminates nuisance of sealant injection and maintains reliable valve performance for a long period of time. 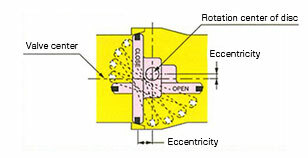 To respond to various handles, four operational angles are available for each size (48 x 48, 45 x 45, 40 x 40, and 35 × 28). 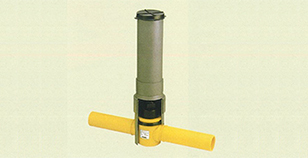 Types with a dissipation tube, convenient for bypass operation, gas diffusion, and gas pressure measurement, are available. 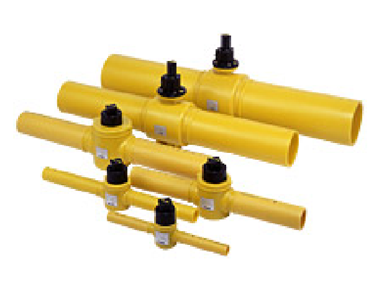 Waterproof sheath sets that protect the valve operating portion from dirt, rainwater, and spring water, are also available.